The neck comes with a “Schaller locking tuner ream” which is a delightful way of saying that some of the holes needed to mount the tuners are pre-drilled in the neck. However not all the holes needed are pre-drilled which means I needed to drill into my new, fancy maple neck. Here’s why. See the two pins on the top of the tuner? They need holes to press into. So out comes the drill. Notice the cool trick of taping the end of the bit? That is so that I drill each hole to the same depth. What I did was to press a tuner into place, which made the tiniest dimples in the wood (it’s very hard wood!). Then I got a punch and pressed larger dimples into the wood. Then I got out my trusty Bosch drill and drilled two holes where the dimples were. Simple right? No! And why not? 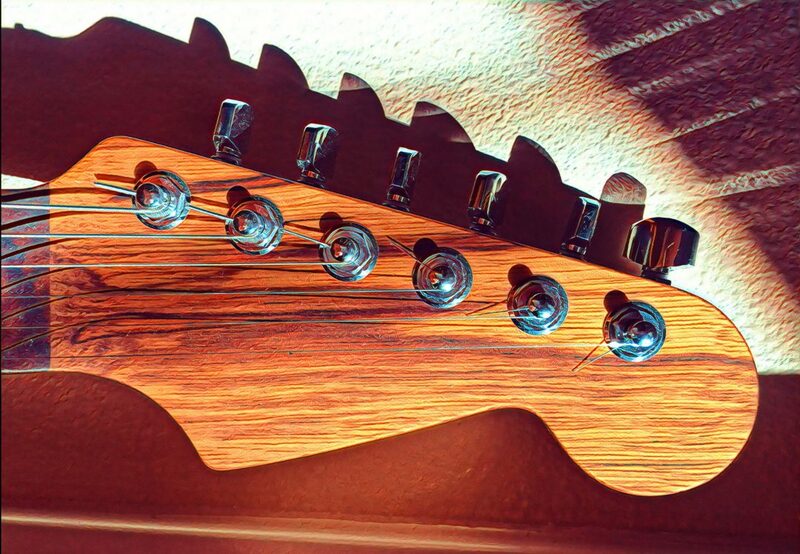 Because these Chinese tuners I bought, the ones made by Ping to look like Schaller tuners, are not all the same. They appear to have significant variation between each tuner in terms of pin distance and sizing. So I measured all the holes using a single tuner and when I was done drilling, that tuner fit perfectly in each position. But not every tuner fit into the proper position. Doh! So I needed to do additional reaming in a bunch of the holes to get the mis-sized tuners to fit. Of course this takes way longer so this wasn’t the quickest step. But I did get to write the word “reaming” once more. And now I am here.